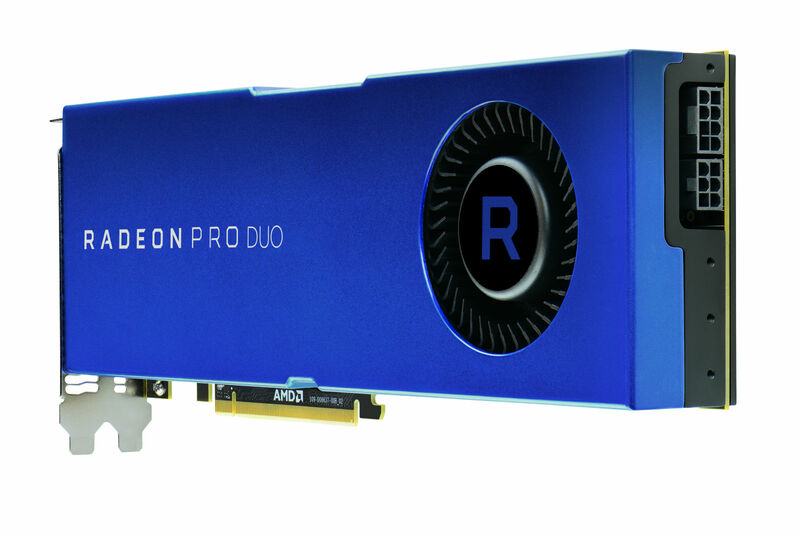 AMD announced the launch of its new AMD Radeon Pro Duo graphics card, which focuses on the professional sector. The new graphics card is based on two Polaris 10 silicon linked together in one PCB, coupled with 32 GB of ultra-fast GDDR5 memory. As expected, it’s 72 Compute Units add 4608 Stream Processors @ 1243 MHz with a TDP of 250W, offers a performance of 11.45 TFLOPs, allowing professionals to manage up to four 4K @ 60Hz monitors or a single monitor 8K @ 30 FPS or 8K @ 60 Hz using a dual cable configuration without forgetting to develop 4K to 360º content with virtual reality in mind. The rest of the specifications are completed with 32 GB of GDDR5 @ 7.00 GHz memory (16 GB per GPU) which together with a memory interface of 512 bits gives us a bandwidth of 448 GB / s. The graphics card requires two 8 + 6-pin PCI-Express connectors for power, offers four video outputs in the form of three DisplayPort 1.3 along with an HDMI 2.0, and will go on sale at the end of May at a recommended price Of $ 999.